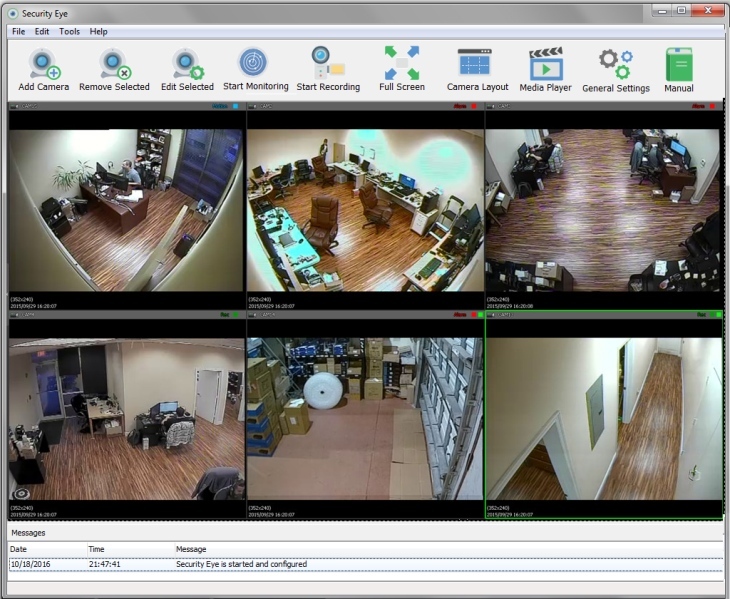 A free software for webcams and network cameras monitoring. Keep an eye on your home, place of business; watch your pets or your kids. When motion is detected, the program can create a video recording of the event, take photos, sound an alarm, or send you a email or sms notification.Security Eye is easy to use and extremely reliable for day-to-day operation. Configuration takes only a few minutes, even for a novice.Video Security Features- Use motion sensing to trigger recording, or record continuously or periodically.- Overlay the current date/time- Use a timer to determine when the system is armed.- Images are captured as JPEG images, and videos are compressed with xVid encoder.- Receive alerts via loudspeaker, email, and even SMS message.- Run Security Eye in background so that only you will know about its operation.- The software is absolutely free. No hidden charges, limits or ads. USB Block lets you protect your PC from data loss. Prevent duplication of your data to External Drives, USB Ports, Flash Disks, or data getting burned to a CD/DVD. Block unwanted devices by all means necessary. Automatically blocks IP addresses with hacking attempts on your windows server services (rdp, FTP, SQL-Server) using the Windows firewall. VBASafe is an advanced product specifically designed to protect your VBA code.With VBASafe your VBA code is converted to a format which is unreadable to the human eye but still interpreted as normal code by Microsoft Excel. PortsLock is a firewall with user-level access controls for Windows NT/2000/XP. Once PortsLock is installed, administrators can assign permissions to TCP/IP connections, just as they would in managing permissions on an NTFS partition of a hard disk.